Made from 100% polyester pro-jersey knit 245gsm, this contemporary fit jersey is a replicated design of the on-field 2017 9’s jersey. Named, “Te Toka tu Toa”- “ The Warrior Rock”, the jersey embodies the true spirit of the players and supporters that no matter what the opposition brings, the team will stay strong and endure. Constructed using a high quality 100% polyester pro-jersey knit 245gsm, our adults replica 9’s Jersey is all about showing your support and allegiance to your team. The 2017 NRL Nines Jersey is named “Te Toka tu Toa”- “ The Warrior Rock”. It embodies the notion that no matter what the opposition throws at the players, they will stand strong together with the club and its supporters to create an impenetrable Rock wall like the sentinel rock TeToka tu Toa. “Ahakoa te aha, te toka tu toa, tu tonu” - “No matter what, the warrior rock will endure”. 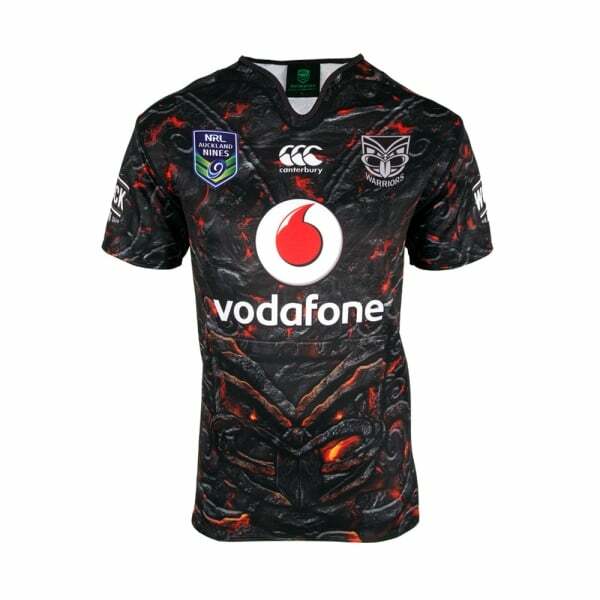 Show your support for the Warriors 9’s with this replica jersey.